dalla Rosa Gallery is delighted to present Welcome to the Multiverse, a solo exhibition of new works by Christina Mitrentse. This body includes drawings, collages, small sculptures and limited edition prints - revolve around the idea of multiverse, defined as an infinite realm of being or potential being of which the universe is regarded as a part. Since 1999 Mitrentse has been developing the Multiverse series by accumulating a variety of images with the aim of mapping infinite parallel worlds and their interaction with the (perceived) real world, following in the footsteps of conceptual artist John Latham among other references. Formally speaking her work polarise into two groups defined by scale. 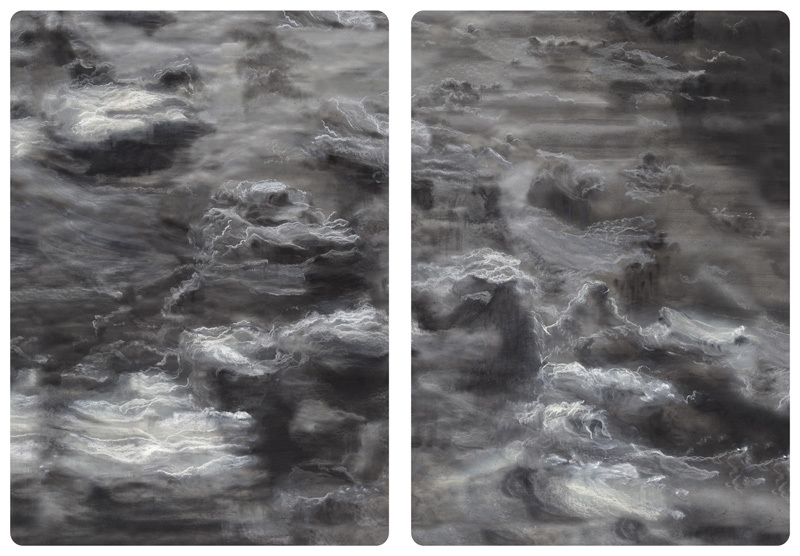 Large scale highly detailed landscapes that she builds up with layers of graphite, pastel and pencil, emphasizing the complexity of the phenomenal world as if seen in a panoramic aerial photograph. Of these, arts writer Michael Hampton (Art Monthly) wrote: “the artist’s relationship with the physical properties of the medium is what Mitrentse calls 'shifting touch' facilitated through smashing graphite and silver pastel into powder, smudginess itself becoming a symbolic overlay of the new multi-time-space”. In her small scale works Mitrentse combines the research into the multiverse with the way a book can influence a person's life, for example the Science Books drawings (2012-13) are inspired by scientific publications written by popular modern thinkers such as Brian Cox, Stephen Hawking, Roger Penrose, that present complex subjects to a broad audience. There is a distinct shift towards abstraction in the series of drawings and collages Wounded Super-Selene I – IV (2012-13), which depict round graphite forms resembling natural satellites, their surfaces populated by book-like forms emblematic of the spectators' knowledge.